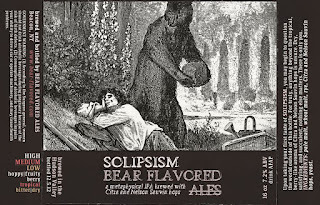 It usually takes me a couple paragraphs to explain my intentions and planning for a new brew — "what sort of wacky hijinks is Bear Flavored up to this time?" and so forth. That's not going to be necessary here. 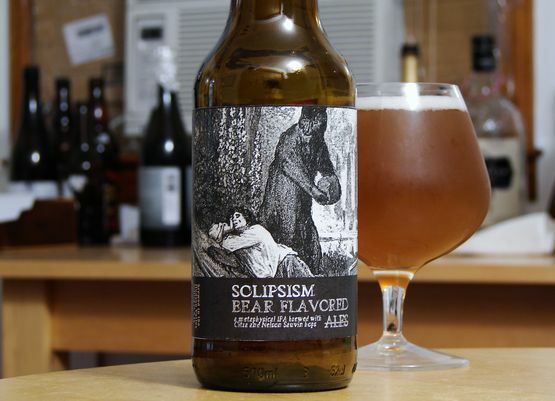 The idea behind this beer — what I'm calling Solipsism — was simply to brew an IPA with my current favorite hops: Nelson Sauvin and Citra. What other explanation do you need? As I've been doing with just about every hoppy beer I've brewed in the last year, I tweaked the grain beer around a very basic premise. I've been honing in on my ideal IPA grain bill, realizing that there doesn't have to be much to it — base malt and a little something for head retention. (I'm avoiding any crystal malts in my IPAs from here on out). Here, it's the Canada Malting Pale Ale Malt that I've been using, with single digit percentages of wheat malt and rye for head retention and mouthfeel. While I will still continue to tweak, trying new combinations and malts, I'm happy with the result of this combination. A thin head remains for the entire beer, and the mouthfeel is soft and crisp, clean, but with a body that's just slightly creamy. (It would probably be even creamier and drier if I had used Conan yeast, but more on that later.) I was fortunate to hit the carbonation dead-on with this batch too, and the result is probably my best IPA to date. That Nelson Sauvin and Citra make for a tasty IPA is hardly surprising, but man, they make for a tasty IPA. The aroma on my hoppy beers often doesn't have the endurance I would like — huge and bold and awesome for a week or two, then slinking down to something much milder after that. It's inevitable that the aroma of any hoppy beer will dissipate over time — nature of the beast — but Solipsism at least smells incredible in its early stages: berries, grapefruit, a big citrusy "hop character," with extremely pleasant fruity undertones that you could pick apart even further. The flavor breaks from the aroma more than I'm used to in an IPA, with a dank character pushing aside the citrus and berries for a moment — I don't get any of that in the nose. I've heard that both Citra and Nelson can come across as dank, and would seem this character is exaggerated when they're together. The two hops have all the huge range of fruit flavors you'd expect, although the "berry" character of Nelson doesn't come through quite as strongly as it does in the nose, or in the Nelson Sauvin Single Hop I brewed earlier this year — probably just because there are so many other things going on. One of my friends has mentioned a few times how much blueberry character he got in this, although I think the flavor isn't quite that specific. The tangy character of Nelson, combined with the intense fruitiness of Citra, gives this a potent over-ripe tropical fruit character. It's tart, citrusy, grapefruity, and extremely tangy — the tangyness enhanced by the dankness, I think. It finishes crisp, dry, and bitter, but it doesn't linger. I love this kind of IPA: succulent, intense, drinkable. As I've come to expect with my IPAs, the character of this has unfortunately changed (mellowed) between when I drank the first bottle until I got this post up on the blog, particularly in the aroma. (You could smell a bottle of this from across the room for the first week; now, it's quite a bit milder). The taste has retained a clear and vibrant fruitiness — just less intense as time passes, of course — and with nothing darker than pale ale malt in the grain bill, there's little malt character to bully its way above the hops. I'm super happy with that, contrasted to the IPA I brewed last summer, which was excellent for a week or two, then abruptly settled into "average/good" as the hop flavors mellowed. What makes the difference? Does this particular hop bill hold up better? Has my technique improved? I suspect it's a bit of both, and that my IPAs will achieve a bit more endurance once I start tweaking my water profile, now that I got a report for Beacon. I also suspect that a kegging set-up would help to combat this rapid mellowing effect further. With the ability to dry-hop in kegs, you can prolong your hoppy aroma as well as ward off oxidizing effects. Unfortunately, I doubt I'll be able to keg for quite some time. While I don't think this recipe requires any major adjustments, I do wish I had fermented it with Conan yeast, but I was awaiting a re-up and didn't quite trust the health of my yeast reserve. It's not that S-05 showed any shortcomings here — everyone and their dog knows American Ale yeast is good for IPAs — but with Conan, could this have been better? I suspect the flavor profile would be a bit different, though I'm not sure how. The next time I brew a "regular" IPA like this, I'll probably split the batch between Conan and a more neutral yeast to compare the results. Great post. I was wondering at what temp you fermented with S-05? I have never had beer fermented with Conan, but have heard that S-05 throws peachy esters when fermented at low temps, similar to the fruity character Conan gives. I just brewed a Double IPA with S-05 and fermented at 59-60 degrees, sure enough lots of peach, apricot, and tropical fruit notes from the yeast. Should be a great beer. Did you ferment this beer colder, or more along the recommended temp. range? Hi, I just did a Citra - Nelson addition to an old IPA in my keg that was flagging. I added about 2 oz Citra and 2 oz Nelson to 3 gallons of wort in the keg. It is a lot more DANK than I thought it would be, as you say! I thought it would be fruitier. I think the Citra has a dank quality to it, and the Nelson Gooseberry adds to that somehow. It's not my favorite, but it is interesting. Do you have any ideas for great hop combinations? I tried a Simcoe,Amarillo,Citra in equal amounts that I thought was great. I also did a Simcoe, CTZ, Summit, Comet that I like a TON. It's dank but in a really great way. I also tried dry hopping a wet hop beer that I didn't like with about 4 oz Apollo in 2.5 gallons of beer. It is the dankest beer I have ever had. I hated it! It reminded me of a parmesan cheese baked potato kind of! I think Summit, Comet and Apollo add a great onion/garlic/dank character as an accent in a hop regime. Too much and they turn it into a super dank-bomb that is unappealing! The one hop I've been using that never seems to disappoint is CTZ. I can add it into any hop combination, and the beer is fantastic! I should try a pure CTZ IPA soon! On that note, what has been your favorite IPA malt bill after more experimentation?! I like almost 100% 2-row, mashed really high, like 165F. You get low attenuation, but it is really dry still, so it has a ton of flavor with less alcohol for the same OG. I think I should increase my body though. i think I'll try your suggestion of some Rye, maybe 5%? I am making a Rye IPA no that has 15% so we'll see how thick that seems.